A drink to celebrate each day! Popular children's song "The 12 Days of Christmas" may be irritating on its own, but these 12 cocktails can make even The Muppets' version tolerable. While a wildly popular internet rumor has made the myth that the gifts referenced in the song are a hidden catechism memory device for persecuted Catholics, most experts agree that "The 12 Days of Christmas" is likely either French or even ancient Greek in origin. It was probably a game in which each person has to recite the gift that was given, with more gifts added as it goes to make it harder. The person who messed up was required to give a gift (such as a sweet) to the other player(s). The items in the list are probably somewhat literal, and may even refer to birds. Sometimes a cigar is just a cigar, we guess (or a blue jay?). Fun fact: According to The New York Times, if you were to purchase all the gifts from the song, it would've cost you $107,300 in 2012. Now that's love! If you've ever had a pear tree in your backyard, you know there's nothing better than freshly juiced pear. We've combined fresh pear juice with some unexpected flavors to create a truly unique beverage to celebrate the first day of Christmas. Rub the lemon wedge lightly around the rim of a cocktail glass to wet it and swirl it on a small platter containing the sugar to rim the glass. Retain the lemon wedge. In a cocktail shaker filled with ice, mix the pear juice, vodka, ginger syrup, cardamom, a squeeze of lemon from the retained wedge and the splash of sparkling water. Shake to mix. 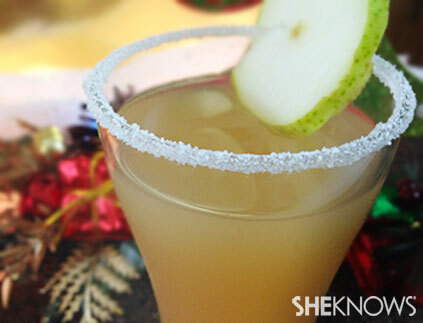 Strain it into the rimmed cocktail glass, garnish with a slice of fresh pear and serve.